Your standard operating procedures, work instructions and forms are what define the inner workings of your company. Making sure that these documents are up to date, correctly approved and signed off, and that the right employees have access to them, is quite a challenge. 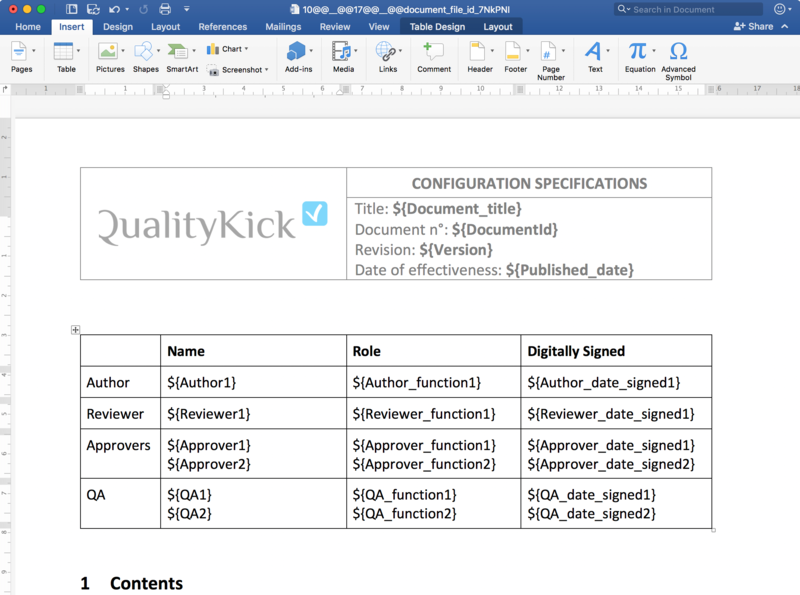 Edit your documents with MS Word and save them directly in the QualityKick cloud. At QualityKick we know that you prefer to use your regular desktop applications like MS Word or Excel to edit your documents. That’s why we have seamlessly integrated with MS Office. Clicking on the Edit button in QualityKick automatically opens it in the right MS Office application and upon saving, the file will immediately saved back in QualityKick again. Why would you write this information in your document manually if QualityKick already knows this and can insert this for you automatically? 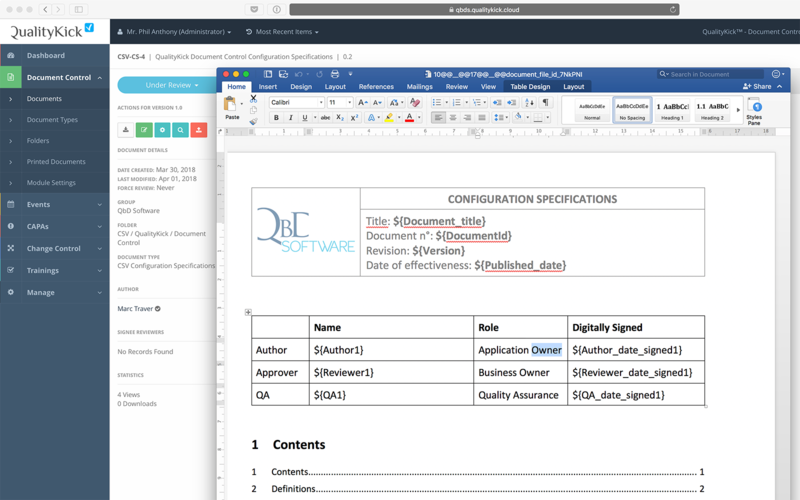 You can use variables throughout your document which are then automatically replaced to show the authors, reviewers and approvers who signed off, their electronic signature, the document ID, title, publication date, and version, and much more! Approval workflows are configurable and completely automated. Once configured, QualityKick sends out email notifications to the necessary people to request their approval exactly on the right moment. Additionally, it takes care of document expiry for you too, resetting the approval workflow for the next version automatically. 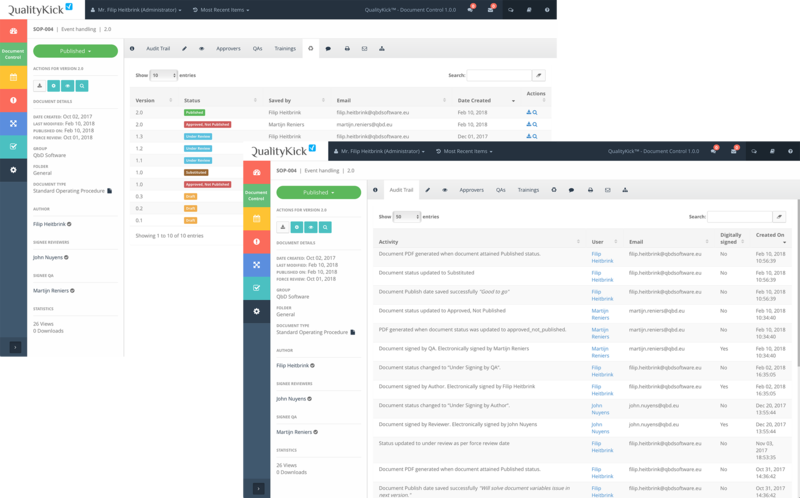 Besides logging all the actions that employees perform during the approval workflow and in document settings, QualityKick also saves each and every document version when a user is working in the document. This gives you full control over the What, When and Who of your documents. Create groups to define collections of users and then place documents in one or more of these groups. This way you can easily limit who can see specific documents. The rule is very simple: if the user is not in one of the groups of the document, the user will simply not have access to it. Multiple Authors, Reviewers, Approvers and QA persons are supported in the Document Control module. These settings can already be pre-configured on document type level and are then automatically inherited when creating a new document. However, as exceptions are sometimes necessary, you can always override this for a specific document. We all know how risky it can be to have old versions of printed documents floating around. The use of such a document by some employee can create quite a mess. On the other hand, it’s not easy to manage printed documents and their whereabouts. In the Document Control module, you can print a document and define a location where the document will be stored. When a new version gets published, you can then know where to collect and destroy the old documents and mark them as “destroyed” in QualityKick. You can also see a full list of “printed documents” to know exactly what’s floating around in the company in paper format. Obtain peace of mind by having all your important documents in a central place, available to the right employees and ready for audits. Configuring QualityKick for first use is a breeze. We will do that together with you while we explain the different configuration options. Once you are set up, you are not on your own. If you come from any other QMS application where your documents and templates are stored, we can help with the migration of your data. Payment depends on the amount of QualityKick modules you use and the amount of users you create. Therefore you can start small and add more modules and users according to your needs. QualityKick runs in the Amazon AWS cloud where you will have different environments (TEST/VAL/PROD) at your disposal in separate virtual private clouds (VPC). With backup, disaster recovery and scalability out of the box. QualityKick has been developed and validated according to the 21CFR11 and Annex 11 guidelines. Once you become a customer our goal becomes to help you get the most out of QualityKick by following up proactively on your progress. 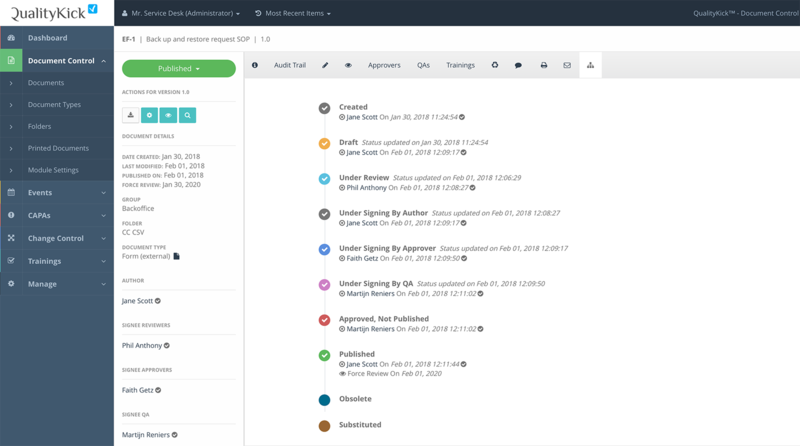 The Document Control module from QualityKick elegantly solves the burden of reviewing, approving and signing documents, and helps you to ensure that documents are kept up to date over time in an automated way. What I like the most of Document Control is that approval workflows can be longer or shorter according to my needs and that I can see a visual “timeline” of where the document already went through and what still needs to be done to get it published. The best thing of Document Control and QualityKick as a whole is the user-friendlyness. People don’t have time to learn complex applications anymore. Applications should make our lives easier and that’s exactly what QualityKick does. Founder & CEO of Quality by Design N.V.
but if you still have any doubts, please contact us! What is a typical approval workflow for a document in QualityKick? This is quite configurable, but there are 4 main steps, or actually roles, available: Authors, Reviewers, Approvers and QA persons. The drafting of the document is done by one or more authors. Once the document is pushed to the review status, one or more reviewers need to review it. Reviewers can still edit the document, so after the review step, if QualityKick detects that changes were made by a reviewer, authors need to sign off on it later again. After the review step, the document goes into the next status which requires one or more approvers to review and approve the document. Approvers cannot edit the document anymore. Once approvers have signed off, one or more QA persons need to sign off too, after which the document can be published immediately or at some point in the future. Can I have a shorter approval workflow? We only need the author and QA to sign off for specific documents. Yes, sure. The system offers the possibility to define authors, reviewers, approvers and QA people for sign off purposes, but you can leave out reviewers or approvers for example. You can do that on document level or you can completely deactivate a step in the module configuration. Can I use Microsoft Word to edit my documents? We have implemented an integration with Microsoft Office. So you can use your trusted MS Word, Excel or Powerpoint applications to edit documents, which are then automatically saved in the QualityKick cloud upon clicking save in your desktop application. Can I use document templates to easily create new documents? Absolutely. We call these Document Types. A Document Type could be an standard operating procedure, or a work instruction, for example. For that document type you can then upload a file as a template which is then automatically copied when you create a new document. 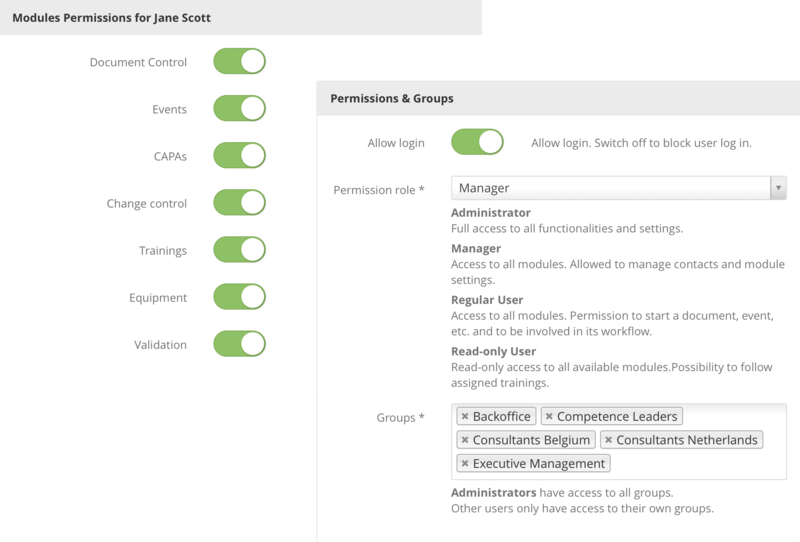 There are 4 types of users in QualityKick: administrators, managers, regular users and read-only users. The first 3 can create, edit and participate in the review and approval workflows. Read-only users can obviously read documents and also mark them as Read&Understood. Do you provide MS Active Directory support? How does it work? The AD/LDAP integration is meant for companies who use Microsoft Active Directory to manage employee access to software systems in a centralized way. This way, employees only need one user ID and password to login into many of the software systems at their company. With Single Sign On (SSO), the user doesn't even need to provide its user ID and password every time. As they are logged in to their PC, credentials are automatically passed on to the system they want to access, logging them in instantly without showing a login page. QualityKick has an integration with Microsoft AD over the LDAP protocol to provide exactly this functionality. Additionally, when users in QualityKick need to sign off on a document with their electronic signature (normally their QualityKick login+password) they can use their Active Directory ID and password. How safe are my documents in QualityKick? All data in QualityKick is encrypted at all times, both in transit (between your browser and the platform) and at rest (when data is stored). QualityKick runs in the Amazon AWS cloud, which is still considered the best cloud infrastructure provider according to Gartner’s magic quadrant and complies according to a plethora of regulations. We encourage you to take a look at it here. Each client gets its own separate database. Or actually better yet: each client gets 3 different environments (TEST, VAL and PROD) and for each environment they get a separate database. In other words, data from different clients is never sitting in the same database. The QualityKick platform runs in a VPC (virtual private cloud), which effectively separates it from the rest of the Amazon AWS clients. In the VPC, it is divided into a 3-tier system: application servers, database servers and file storage are separated, which makes it easier to scale out automatically when demand increases and therefore ensures a speedy user-experience. Besides the standard automated backups of client data, we use many different Amazon AWS services to ensure data integrity, application reliability and to have robust disaster recovery mechanisms in place. Data security and data integrity are aspects that we take very seriously, as we are aware that your business depends on it. And ours too! Can I limit user access to certain documents in QualityKick? Yes, with the Groups functionality you can configure which users have access to which documents. Users can have access to one or more groups and documents are always placed at least in one group. Therefore, the rule is simply that a user must have access to at least one of the document's groups in order to see the document or gain access to it. Does the Document Control module support full content search? Yes, but only for the following file types: docx, xlsx, pptx and pdf. How can I migrate my documents from my current QMS system to QualityKick? It depends on the system you are currently using and on the amount of documents you need to migrate. If you only have tens of documents you could use the document import feature to import your documents one by one. But if you have more, we can help you to automate the process by developing an import script. Depending on the complexity of your data, we might need to charge you the development hours of this script, but it will safe you loads of time. How are document versions handled? QualityKick handles the versioning of documents for you. When you create a new document, it starts at version 0.1. While editing the document, QualityKick will save these as 0.2, 0.3, 0.4 etc. Once the document is finished, approved and published, it is published as version 1.0. When the document is later reviewed, the version is increased automatically again to 1.1, 1.2, 1.3, etc. until you publish it as 2.0 again. All intermediate document versions are saved and can be consulted depending on your permission role. Is there a "read-only" kind of user type? Yes, there are 4 types of users in QualityKick: administrators, managers, regular users and read-only users. The first 3 user types can edit and participate in the approval workflow, the read-only user type can only read documents and mark them as Read&Understood.